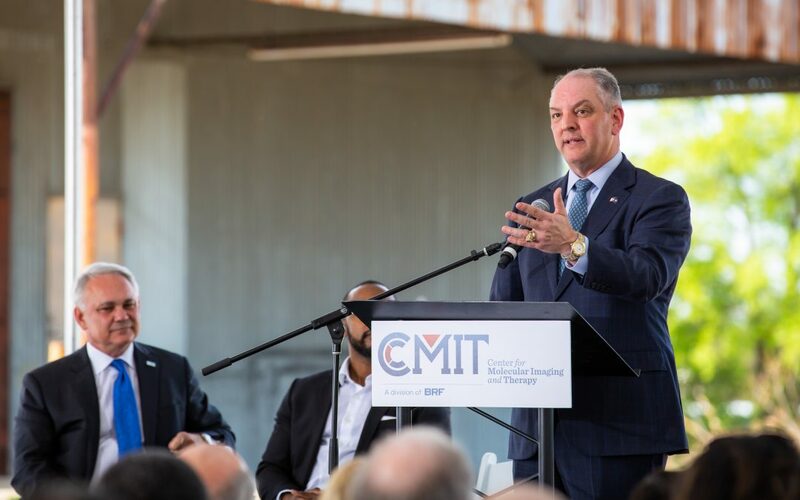 BRF is leading innovation in molecular imaging and research in Louisiana through a new $14.2 million, 20,000 sq. ft. Center for Molecular Imaging and Therapy (CMIT). A demolition ceremony involving local and state government officials at the new site at the corner of Kings Highway and Mansfield Road in Shreveport marked the groundbreaking. The new facility will house radiopharmaceutical production equipment and operations, patient imaging services, and a clinical and translational research program. CMIT Executive Director Pradeep K. Garg, Ph.D. speaks at the CMIT groundbreaking and demolition event. The program Dr. Garg will lead is the evolution of BRF’s PET Imaging Center, the first molecular imaging scanning and radiopharmaceutical production facility in the state, which opened in 1995. The center was one of the nation’s first full-service, non-academic centers and grew into one of the most active centers in the South, serving over 46,000 patients. With new production equipment and expanded capabilities, CMIT will grow its catalog of novel radiopharmaceuticals to include applications in cardiovascular disease, prostate cancer, Alzheimer’s disease and related dementias, hyperinsulinism, and pancreatic and other cancers. Construction of this new facility adjacent to BRF’s headquarters in the InterTech Science Park will consolidate CMIT operations under one roof on the Shreveport Healthcare and Development Corridor.